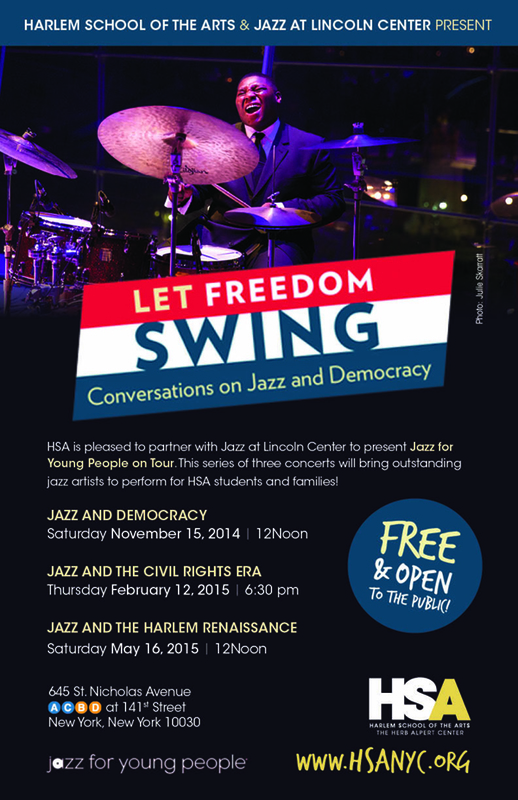 HSA is pleased to partner with Jazz at Lincoln Center to present Jazz for Young People on Tour. This series of three concerts will bring outstanding jazz artists to perform for our students and families. This concert will illustrate the ideals of American democracy through the lens of America’s greatest and most democratic art form — jazz. The 1950s and 1960s were a time of social and political upheaval in America. This was reflected in the music of the era, and inspired some of the most passionate and emotional performances and compositions in the history of jazz. This concert will focus on the music and personalities of this time period, and demonstrate the impact of jazz as a form of protest and instrument of social change. The Harlem Renaissance was a period of flourishing artistic expression and cultural activity during the 1920s and 1930s, based in the vibrant New York City neighborhood. During this time, some of Harlem’s leading black writers, artists, musicians, and political thinkers emerged at the forefront of American culture. This concert will focus on the innovations and achievements of this era and the importance of Harlem in the development of jazz.